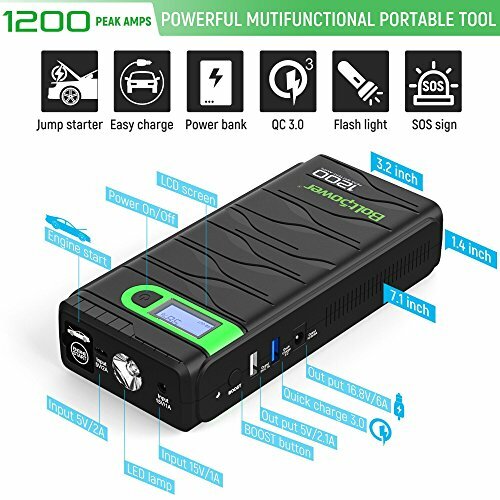 Dual USB power bank is capable to fully charge most smartphones, tablets, phablets, bluetooth speaker, activity tracker, smart watches and other 5-volt USB devices. • It may not be able to start your engine If the unit is below 25% battery life. • Do not connect the positive and negative polarity together when the unit is powered. 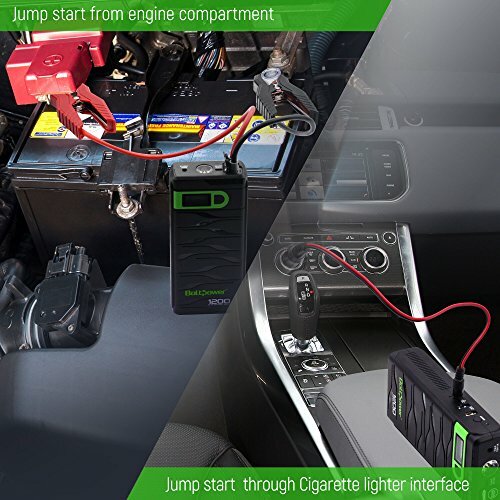 • Please disconnect the jumper clamps within 10 seconds after successfully jump start the vehicle. 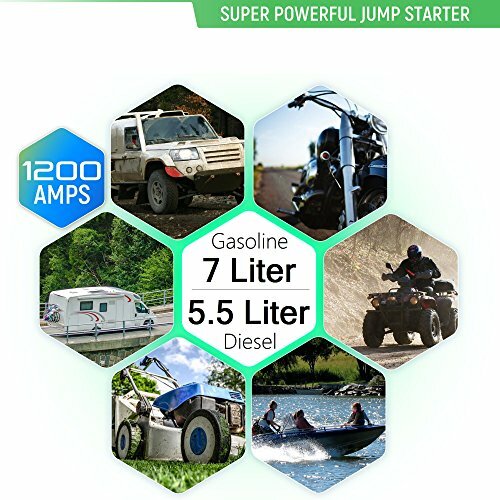 • Gasoline engine up to 7 Liter. • Diesel engine up to 5.5 Liter. 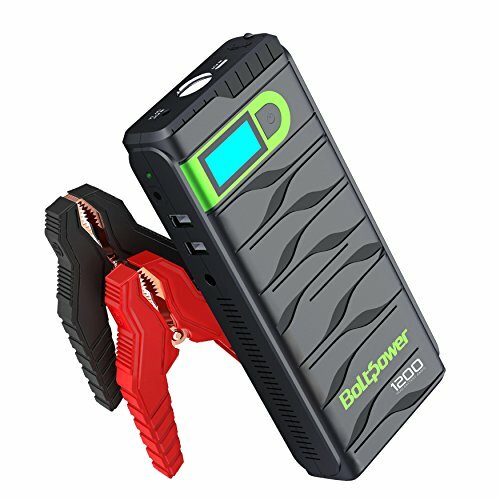 Bolt Power N02 (Beast Model) lithium portable jump starter rated at 1200 Amps is capable to jump start Cars, Boats, Trucks, Tractors, RV, SUV, Motorcycles, Lawnmowers, Trailer and more. 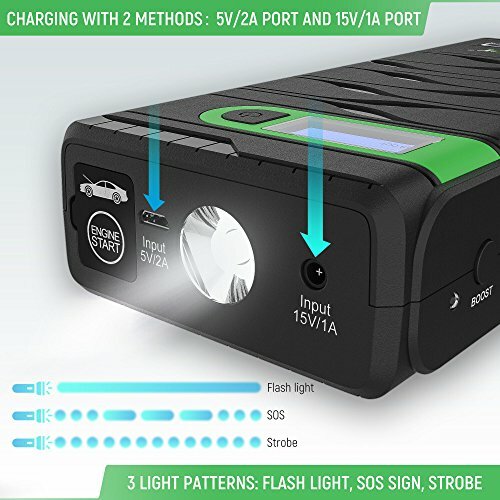 Built in flashlight has three modes (solid beam, strobe & SOS). Digital Display to monitors charge level of internal battery and USB output amperage. Safety Protections: Over-charge, overload, over-current, short circuit to ensure your smartphones, cell phones, tablets being protected guarantee! Storage temperature -20 Fahrenheit (°F) to 130 Fahrenheit (°F). Battery life can hold up to 3 months in your back trunk without needing to be recharged. Hassle-free 12 months limited warranty. 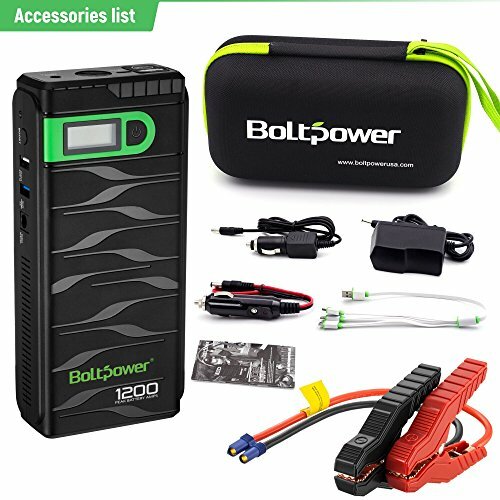 If you have any questions about this product by Bolt Power, contact us by completing and submitting the form below. If you are looking for a specif part number, please include it with your message.